Vintage Star Wars & Batman Pop Art Prints | Nerd Much? Yoda in a tie? Count us in. 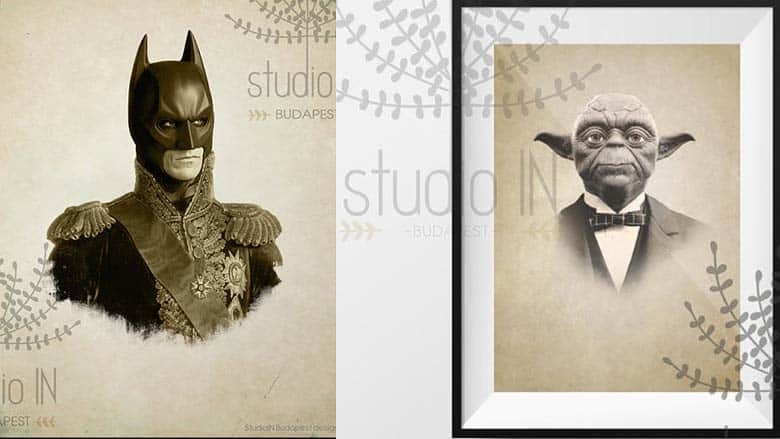 It doesn’t take but a quick web search to find great pop art prints from your favorite movie franchises, but when we came across these Vintage Star Wars and Batman Pop Art Prints, and other pop art by StudioInBudapest, we had to share them with our readers. The studio has quite a number of great pieces of wall art to hang on your walls. They have the vintage Yoda posters for Star Wars fans, and Batman prints for Batman fans, but they have so much more, including a C-3PO, TMNT, Guardians of the Galaxy, and one with Marvel Characters. But what makes these prints unique is their vintage take on our heroes and superheroes. For instance, Batman wearing a British Redcoats-esque getup, Yoda wearing a suit, and the Ninja Turtles wearing something you’d see on an army General. There are also other Star Wars art prints available, including Ben Kenobi, Princess Leia, Chewbacca in a suit, and more. They’re all something a bit different than the norm, and that’s why they work so well. Here’s to hoping the studio will introduce some of the characters from the new trilogy, like Rey, Finn, BB-8, and Kylo Ren. But if you’re looking to get away from the ordinary takes on your favorite characters, check out these great pop art prints. For more ridiculously cool and nerdy stuff to buy, stay tuned to Nerd Much for daily finds.